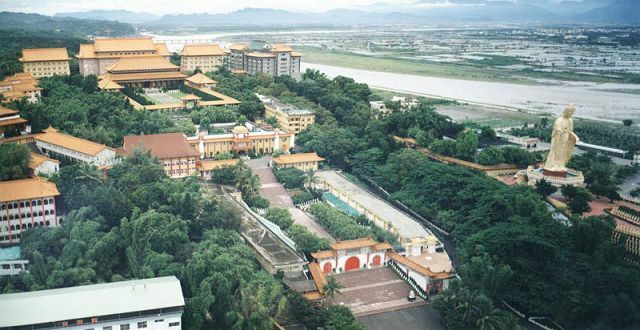 In 1967, Venerable Master Hsing Yun, the founder, established the Fo Guang Shan (Buddha's Light Mountain) Buddhist Order, which is the largest monastery in Taiwan, encompassing over 600 acres. Fo Guang Shan is a Mahayana Chinese Buddhism monastic order. Fo Guang Shan belongs to Lin-Chi Ch'an School. For the past 30 years, the Master has been instrumental in expanding religious freedom throughout Asia. The Fo Guang Shan Buddhist Order, through a Humanistic Buddhist orientation, works to unite all Buddhist schools and sects The objectives of the Order are to provide confidence, joy hope and convenience to people. All Fo Guang Shan temples throughout the world are working to promote 'humanistic Buddhism' and 'transform people and the world' under the direction of Ven. Master Hsing Yun to bring about a 'Pureland on earth'. There are presently over 250 Fo Guang Shan temples throughout the the world. Nan Hua Temple and the African Buddhist Seminary are also carrying out this compassionate vow of Ven. Master Hsing Yun by introducing the teachings of the Buddha throughout the continent of Africa.